Again, you say this team needs to play to its identity, but you previously stated identity is only established in December. What’s with the flip-flopping? The Packers’ long-term identity is that of a team that beats you with offense, especially with its passing game. By the end of the season, we’ll know what this year’s team’s identity is. Will it match its long-term identity? Hey, Vic. who’s the guy who keeps saying running the ball will fix everything? I’m the guy who said it and it was absolutely true on the Packers’ touchdown drive. James Starks was the star of that drive. The fans have spoken and we got a two-FB formation. It gained 15 yards on a pass to one of them. It worked, Vic. Just thought you’d like to know your all-time favorite hick QB, Terry Bradshaw, thinks the play-calling is what’s to blame for the offensive struggles. Why do you think this is, besides just being a dumb old hick from Louisiana? Or is he onto something? Wait five minutes and ask him again. Everybody gets a scoop. I enjoy your insights, but I’m tired of reading a lengthy reasonable question only to read your two-word sarcastic answer. If a question asked in good faith isn’t worth the time and effort of answering, then pick another question. 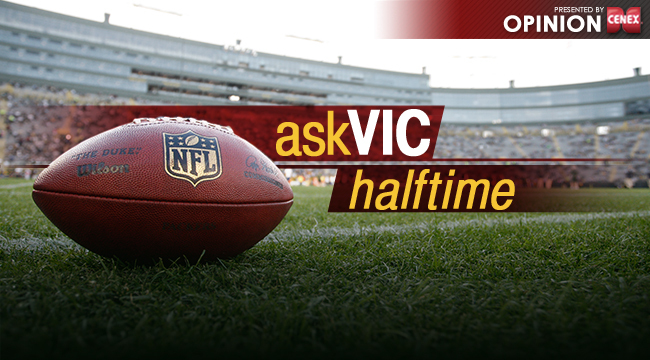 Vic, what’s the best defense against a QB like Cam, who can hurt you with his feet? If he can only hurt you with his feet, the answer is make him be a passer, but Cam Newton is hurting the Packers with his arm, too. His 52-yard pass to Devin Funchess was a thing of beauty. Damarious Randall had tight coverage. What is wrong with Lacy, or are your continued lack of responses on this subject an indication you’ve thrown him under the bus? As I write this, he’s only carried the ball three times. His best run was nullified by a holding penalty. Based on the little I’ve seen of him, I believe Starks is seeing the cutback lanes better than Lacy is. In a zone-blocking scheme, it’s all about finding the cutback lanes. It was in one of the “Ask Vic” columns late last week. Lots of empty seats. I thought Carolina was excited for this game? The seats have filled in. This place is very loud. No fan base can be as great as the Packers’, but I think Panthers fans are deserving of respect today. What is going on with the defense? It’s like a switch flipped a couple of weeks ago and they forgot how to play. The third-and-16 play was horrendous. It’s a head-scratcher. There had to be a miscommunication for one defender to squat on the coverage and the over-the-top guy to have been as deep as Ha Ha was. It’s something Dom Capers will explain on Monday. How in the world can an eight-man secondary leave a WR wide open? Somebody goofed. That’s all I can offer. Is it safe to say this team has been overrated and exposed now? Do you understand the Panthers are a 7-0 football team? Errors by the Packers seem to be the story today. Is that what you see? The deep pass on third-and-16 is likely due to error, but I see a Panthers team that’s winning the one-on-ones. Josh Norman is chief among those Panthers. Cam Newton isn’t far behind.